"Judicial activism" is a phrase one often hears in the context of nominations to the U.S. Supreme Court (and other judgeships). Typically, "judicial activist" is a disparaging term — the last thing some people want as a judge is an activist. Defenders of activism seem to be few and far between. But just what is a judicial activist? As the term is used in contemporary politics, an activist is often nothing more than "a judge with whom I disagree on policy matters." If activism means nothing more than an ideological opponent, then the term has little if any value in discussions of judges. Activism does, however, have some accepted meaning among social scientists. In general, an activist is one who is unwilling to defer. Conversely, activists are judges who are willing to substitute their own judgments for the judgments of others, which is obviously not deferential. In the American context, a non-activist — which I will label in a moment — is more willing to defer to the so-called intent of the framers in matters of constitutional litigation, precedent in the context of common law and legislative intent in interpreting statutes. An activist is a second-guesser — instead of taking constitutions, precedents and statutes on their face, an activist is willing to mobilize and apply additional criteria in making judicial decisions. Relying on strict and narrow legality, with whatever its consequences, is not the decision-making style of the activist judge. These additional criteria are easily, but not entirely helpfully, referred to as "justice." Activists are willing to put laws (precedents, statutes, constitutions) to the test of fairness. In this sense, they are unwilling to merely defer. A simple definition of the concept is: Activism means that judges rely on their own judgments of what is fair in the case rather than allowing the constitution, the legislature or prior court decisions to dictate what the outcome of the case will be. It should now be obvious that one term for the opposite of activism is "restraintism." A restraintist judge is one who restrains herself — and restrains in particular any urges to substitute her own judgment for the "will of the law." Restraintists are sometime referred to as "strict constructionists," which indicates a judge who relies as much as possible on the literal and strict construction of the language in statutes and constitutions. Because restraintism also refers to restraining one&apos;s preferences for overturning existing precedents, I prefer that term to "constructionism" (or the closely related "originalism"). An example might help at this point. The First Amendment to the U.S. Constitution states, "Congress shall make no law abridging freedom of speech." This command seems straight-forward and easy to interpret but in fact that has not been so over the history of constitutional litigation in this country. First, there is the matter of "speech" — are all words "speech" (not necessarily); are nonverbal utterances (the wearing of a black armband) "speech" (sometimes)? "Abridging" is also a contentious term — at what point do ordinary administrative regulations (getting a permit to demonstrate) become an abridgement? Even the seemingly clear and plain "make no law" part of the First Amendment is unclear — or perhaps I should say is entirely clear in actually meaning "make some laws but not others." There has never been a serious constitutional scholar or a thoughtful judge who has defended the idea that Congress shall make no law prohibiting speech. From sedition to conspiracy to libel to obscenity to so-called fighting words, the constitution apparently gives Congress wide latitude in abridging speech. The First Amendment — at first glance so easy to interpret — turns out to require a great deal of effort and debate to understand and apply. Laws are of course replete with ambiguous concepts and phrases. For example, what is "due process"? How should we understand "necessary and proper"? What exactly is a "well-kept militia"? How does one "establish" religion? Those who believe that text can be interpreted literally are typically fooling themselves because text so often has no inherent meaning. Judicial activists are not primarily concerned with trying to extract literal meaning from text. Instead, an activist attempts to identify large and enduring principles and values, and apply them to contemporary legal and political issues. For instance, an activist might argue that "privacy" is a value enshrined in the Constitution (even though the word is never mentioned) and that the meaning of privacy changes and enlarges over time. Although privacy clearly means being free from improper searches by the authorities, it also has come to mean being free to control one&apos;s body for sexual and reproductive purposes. An activist tries to make large concepts such as privacy and due process meaningful and relevant in contemporary terms and, most important, to make the meaning of the law fair. How do the American people understand and evaluate the term "judicial activism"? In the context of the last nomination to the Supreme Court — that of Judge Samuel Alito — Ohio State University professor Gregory A. Caldeira and I asked a nationally representative sample a few questions about the concept. To our surprise, to a simple question about whether the respondent had ever heard of the term, only 39 percent said "yes," and this was in a context in which many of the questions in the survey had to do with judges and judging. According to the data, for a politician to label a nominee an "activist" would not necessarily resonate with most of the American people. On the other hand, more than two-thirds of the respondents were able to select the correct definition of judicial activism from the following list of possible responses (we varied the order in which the definitions were presented to the respondents but found no significant differences in the answers). Thus, a large proportion of the American people are familiar with the concept of judicial activism. Even among those who claimed to have never heard about the term judicial activism, 65 percent were able to correctly identify its definition. Most Americans may not easily recognize the concept, but they do seem to recognize the behavior. When it comes to approving of judicial activism, Americans are quite divided. We asked our respondents to assess the statement, "The courts in the United States would be a lot fairer if there were more judicial activists on the bench." Of those correctly understanding the meaning of activism, approximately 38 percent agreed with this statement; a slightly greater proportion (45 percent) disagreed (and 17 percent were uncertain of their own views). Thus, a political appeal to activism is likely to be accepted and rejected by roughly equal numbers of Americans, thereby providing little political advantage. Perhaps the greatest surprise from this survey is that self-identified Democrats and Republicans are equally likely to approve of judicial activism. Among Democratic identifiers, the percentage approving is 40 percent; among Republicans, the figure is 37 percent. Republicans are more likely to reject activism — by a margin of 55 to 38 percent, which of course also means that Republicans are less likely to claim no opinion toward activism (8 percent vs. 22 percent). Thus, polarization on whether judicial activism is desirable is greater among Republicans. Still, the constituency in favor of judicial activism is composed of equal parts of Democrats and Republicans. Party, of course, is often a surrogate for ideology. When it comes to judicial activism, however, ideology is often confusing. Conservative elites have over time been more successful at linking activism with liberalism, charging judges with being "liberal activists" in the vein of William O. Douglas, William Brennan and Earl Warren. Liberal activism is the unwillingness to defer, with judges instead substituting their liberal vision of justice for the will of the law. Under the reign of the Warren Court, charges of liberal activism were commonplace. Nothing, however, binds liberalism and activism; it is easy to imagine, and demonstrate, instances of conservative activism. Conservative activists are those who refuse to defer to liberal laws because those laws violate a conservative sense of justice. Examples abound. Although perhaps I should be reticent about raising the much-debated Supreme Court decision awarding the 2000 presidential election to George W. Bush (Bush v. Gore), many observers regard this as a prime example of conservative activism on the part of the Supreme Court majority. The outcome of the decision was of course conservative; but what makes it activist is that the Supreme Court forged an unprecedented doctrine by which federal intervention in state elections was justified for the first time. The decision might also be deemed activist because the justice casting what many consider to be the deciding vote (Sandra Day O&apos;Connor) was reported to have proclaimed at a cocktail party "this is terrible" when told that a Gore victory in the election was likely. In any event, one can imagine that conservative judges believe that strict legality produces an unjust outcome, and that some of these conservative judges are unwilling to defer to what they regard an unfair conclusion. Conceptually, no inherent relationship exists between judicial activism and ideological stances. But what of the American people — are those who consider themselves liberal more likely to embrace activism than those who adhere to the conservative label? 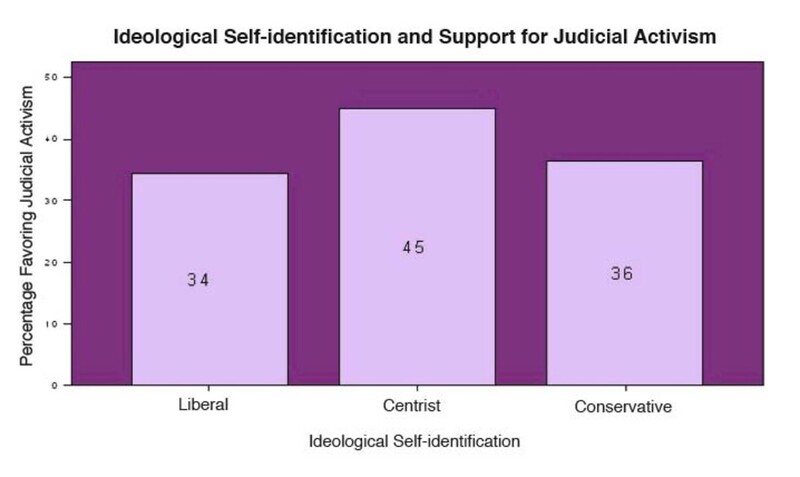 The data from the survey provide another unexpected twist: Self-identified liberals and conservatives are equally likely to embrace judicial activism, and they are less likely to do so than those who place themselves in the center of the ideological continuum. The graph shows this relationship. Slightly more than one-third of the liberals in the sample support activism; the same can be said of the conservatives in the sample. From this point of view, judicial activism is not an ideologically charged term, at least in the minds of the American people. Conservatives and liberals subscribe to quite different views of a just society, but they differ little in terms of whether they believe judges are — or ought to be — active in creating a must just society. I do not expect that the debate of Sotomayor&apos;s level of activism will be disciplined by the way scholars use the concept. Indeed, we are likely to hear conservatives laying the charge of "liberal activism" against Sotomayor, but meaning little more than that they disagree with her ideological predilections. If the findings from this survey are of any guidance, then ideologically focused debates about judicial activism are unlikely to provide advantage to one side or the other. But activism is a concept with meaning in scholarly discourse, and judges undoubtedly vary in the lengths to which they will go in pursuit of a just outcome in the cases they decide. Perhaps the most important question to be put to Sotomayor during the confirmation hearings is that of how to resolve conflicts between legality and justices when they occur. Gauging views of the American people on Supreme Court justices suggests that while empathy is in the eye of the beholder, it's a value most people favor on the bench. Why letting judges speak out during political campaigns enhances democracy and serves justice. The debate building up to the Sonia Sotomayor confirmation hearings suggests that real-world experiences are of suspect value in administering the law. Really? A conservative interest group is becoming increasingly effective at picking and grooming the sorts of judges it likes.